Finished in white, the Solo Plus can be flush or surface mounted, with a 2-position 100mm circular spigot for rear entry or connecting to a vertical ducting system. The powerful centrifugal forward curved impeller allows installations using 100mm ducting in straight runs up to 50m, whilst still achieving 54m³/h as required by Document F of the current building regulations. The new Solo Plus has a choice of two boost/override motor speeds, medium (62m3/h) or high (90m3/h), with an optional third speed for constant trickle ventilation (36m3/h), selectable at installation. Depending on the model, the fan will switch from trickle (if selected) to boost (medium or high) via the pull cord, timer or PIR. 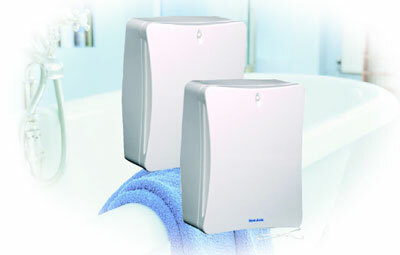 Three models are available offering features such as, Pull cord, Timer, or PIR versions. All models can be wall; panel or ceiling mounted and can be connected to either circular or rectangular flat ducting.